There are two watches on this page... a wristwatch and a pocket watch. I purchased these watches in 1991 while I was visiting East Berlin shortly after the wall came down. Gypsies were selling all sorts of stuff. 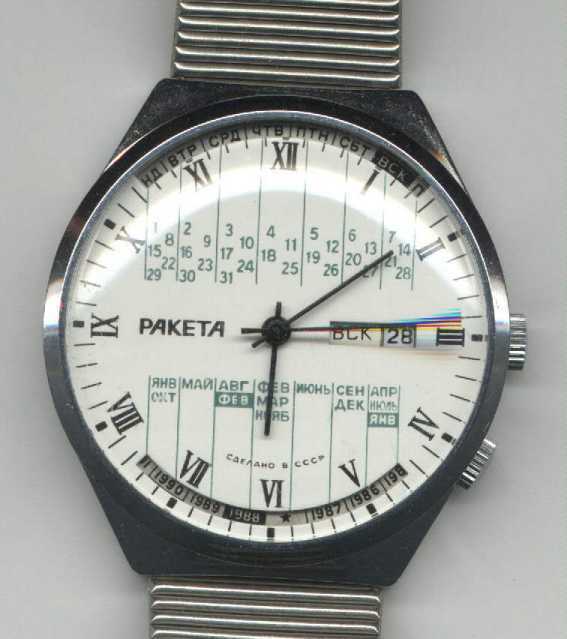 According to them, the wristwatch is of Russian origin, created especially for the Russian army, and was issued to the East German border guards who patrolled the wall by the Russian military. Of the pocket watch they could only say that it was a military issue. 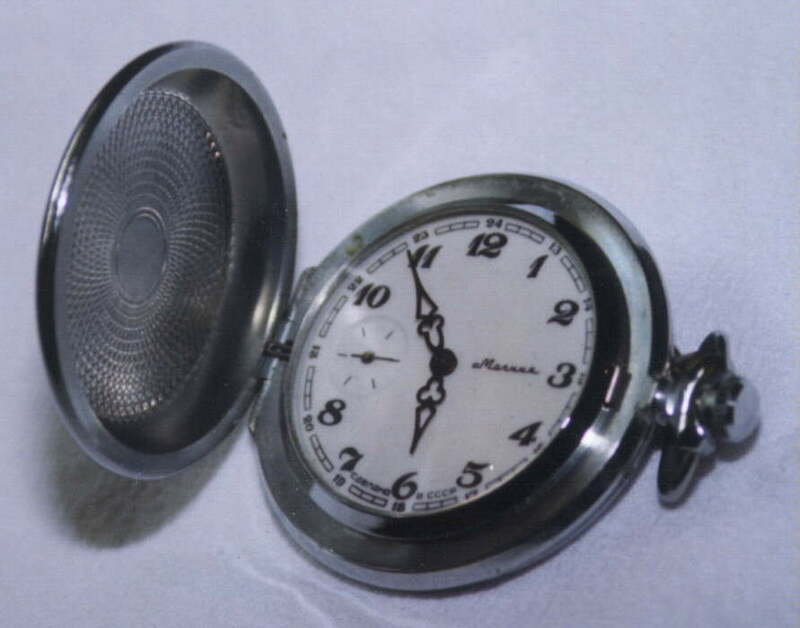 The pocket watch has the years 1941-1945 engraved on the back so I suspect it is some sort of commemorative issue. My local watch repairman tells me that the wristwatch has a jeweled movement, is self winding, and is well built. I have not had the pocket watch examined. If you can tell me something about either of these watches, including value and market interest, I would be most appreciative. This page will take a minute or two to load since the image sizes are quite large. 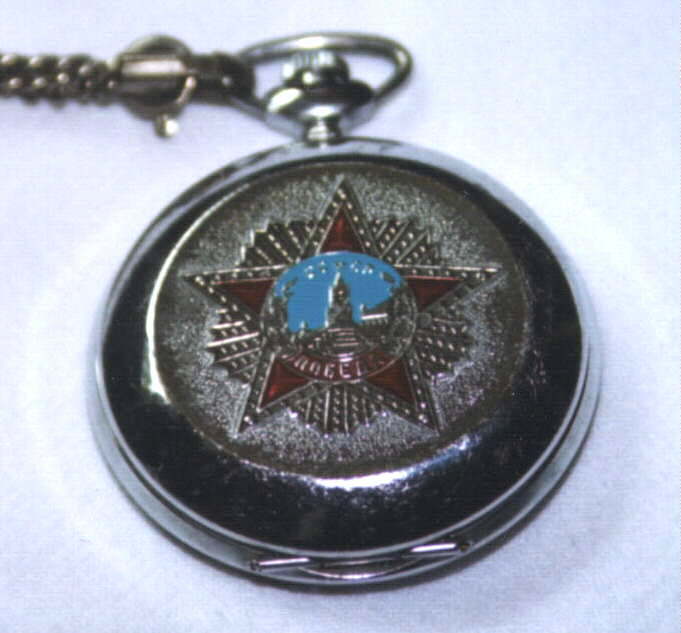 Update – Mr. Ronald Broz was able to tell me quite a bit about the pocket watch below. Here are his comments. I happened upon your page and can tell you something about your pocket watch. · It was made at the Molniya (Molnija) watch factory and is of Russian origin. 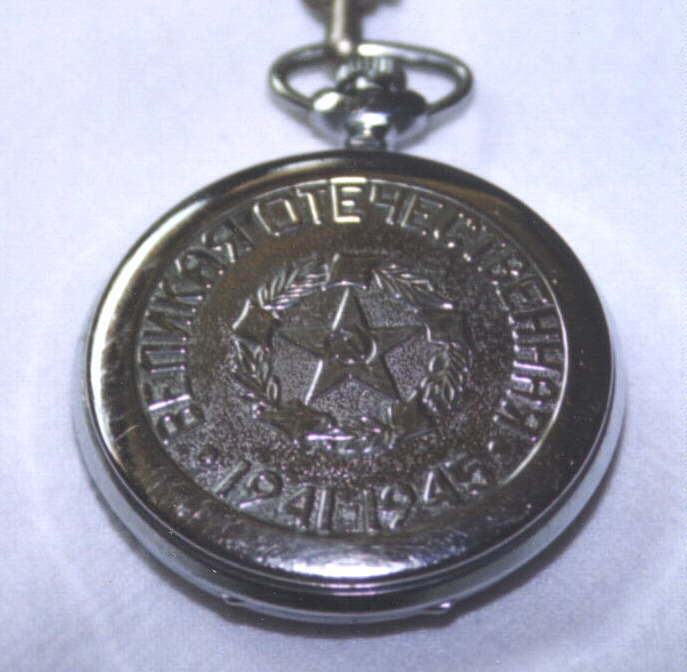 · The emblem on the front is indeed commemorative - it is a miniature reproduction of the Order of Victory, awarded to heroes of The Great Patriotic War (WW2). · Molnija timepieces are very sturdily made and (at least in the past-I've not seen a modern one) to very exacting standards. · This IS a modern watch - available, among other places, at www.sovietski.com or at www.russianartmall.com, for between US$20 - $40. Probably not everything you were hoping for, but I hope it is helpful. I expect it is a quality timepiece - I cannot believe that Molnija has let their quality slip over the years (they started making pocket watches just after the war). The Watch – Write me if you know about this watch. Thanks.